OK, Project Runway fans: here’s a little tidbit for y’all. I was driving downtown recently, headed over to the Dept of Revenue (oh, rapture!) and passed through the Georgia State campus on the way. I’m stopped at a stoplight and look to my right to see a smallish vinyl banner across from the entrance to the Student Center. It says: Tim Gunn to speak, February 22, 3 pm. Say what, now? Why is this the first I’m hearing of this?? It’s true. Next Monday, February 22, our beloved Tim Gunn will be at the Georgia State Student Center ballroom to speak at a FREE event that is open to the public. He’ll talk about his new book, and do a Q & A after, plus sign copies (no word on whether copies will be available for sale on site or if you ought to bring your own). 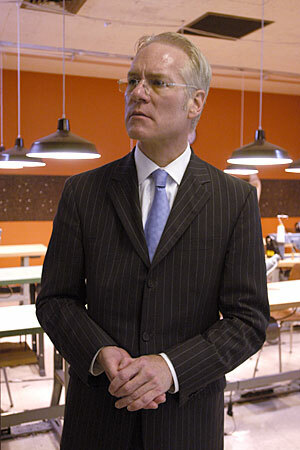 I love watching Tim Gunn, and think that he and Heidi are the heart of Project Runway. I love the fashion and the challenges and the excitement of the program, but Tim’s warmth and genuineness are the glue that hold the show together. I’d love to see a mad crush of people show up to hear him speak and fill that ballroom to capacity–will you be there? ← Saturday Family Day–Snow Day! I saw him at BlogHer last year…I didn’t know who he was, but all the women there certainly enjoyed meeting him. Maybe I should see what that 55” screen with the plastic box around it does when I press the little button in the bottom right corner.